It has 3 modes LED light (high, strobe and SOS), It's an emergency life saver when you go camping, picnic, outdoor adventure or investigation. 1. Don't jump start any engine that exceed the maximum displacement the unit can bear, or it will cause serous damages to the unit. 3. Don't connect the positive and negative polarity together when it's power on. 3. Don't connect the positive and negative polarity together when it's power on. Don't crank the engine for more than 4 seconds. Allow the jump starter to cool down for at least 30 seconds after each jump-start. PORTABLE POWER STATION: Power-up or charge -up anytime, anywhere. 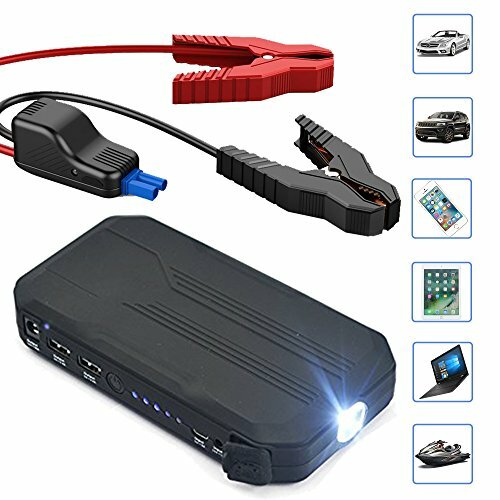 It's power when you need it most, for your car and even for your phone! This Quick Starter gets you or your car, up and running fast and easy. TRAVEL WORRY FREE: Having this car kit emergency road kit would ease your worries of your car battery dying on you during long drives. You have with you 400A Peak 12000mAh of power you can access to jump start your car - enough to charge 5 smartphones and jump start a car up to twenty times. LIFE SAVER: You can use it to power your devices like smartphones, kindle, and laptop while on the go. It is more than just a portable car battery charger. It also has two USB compatible 5V charging ports. It has a powerful 3-mode LED light (high, strobe and SOS) that could be used during emergencies and help save lives. SAFE & RELIABLE: The QuickStarter is both shock and water resistant. It has built-in safety features. It has protection for over-charging, high temperature and short circuit. Safe even to take outdoors on camping trips to power your phones and laptops and also to jump start your car's dead battery when needed. COMPACT CONVENIENCE: The arrancador de baterias para autos unit is conveniently stored in a semi-hard carrying case with yellow wrist strap. It is small enough to store away in your glovebox and light enough to pack in your bag. If you have any questions about this product by Enji Prime, contact us by completing and submitting the form below. If you are looking for a specif part number, please include it with your message.